The Tennis Channel filmed an episode of “Tennis Channel Academy” this week in Ketchum, profiling former No. 1 player Mats Wilander’s traveling tennis-teaching program. Crews took footage of Wilander—a longtime Wood River Valley resident—Wednesday and Thursday at Zenergy Health Club and Spa. Wilander won seven Grand Slam championships during his career. He has spent three months a year for the past four years traveling the United States in an RV with his “Wilander on Wheels” program. 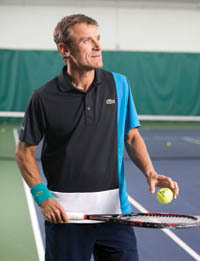 When he’s in Sun Valley, Wilander often teaches tennis at Zenergy. Wilander said he teaches tennis with a “no drama, low-key approach” in the clinics he runs with Wilander on Wheels Chief Operating Officer Cameron Lickle. He said he considered the program to be an idea that was more of a joke than anything at first because he never considered organizing something like it. Tennis Channel producer Nitin Varma said the unique nature of Wilander’s program, which travels all over the country, played a major role in the channel reaching out to Wilander. Varma said the purpose of Tennis Channel Academy is to show professional players different styles and approaches to the game. Wilander, 49, said that much of his motivation to teach the clinics comes from the joy people get through learning tennis from him and Lickle. Additionally, he said he tries to promote Sun Valley as much as possible when he’s out on the road. “We would really like to drum up more interest in Sun Valley and do clinics here,” Wilander said. “We want people to come visit us, see us, add a little bit to the town, economy and lifestyle. It would be really nice to see more people come and visit. Wilander said he has no set criteria for how he picks the destinations where he teaches. The Tennis Channel has not set an air date for Wilander’s episode, but Varma told the Mountain Express it will air after the Australian Open is completed on Jan. 26, 2014.